Tired of scouting for hotels with good views? Try our handpicked attic/loft B&Bs and make your vacay a picture perfect one, with breathtaking views and homely charm. Standing on the edge of a hill and overlooking an orange valley in Mirik, the wooden cottage of Birdsong Home is every city-fatigued person’s dream retreat. Hole up in their airy terrace loft or in the cosy studio space and spend countless hours watching the hilly landscape from the wide open balconies or the pergola on the rooftop. Wooden interiors, floor-to-ceiling windows and modern amenities like WiFi and washer makes this homestay a gem of a find. Squad vacays are made of fun and laughter, songs and long chats. 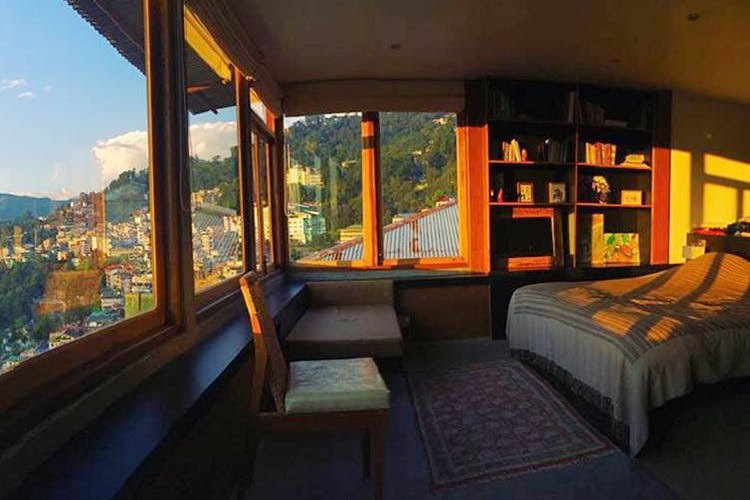 And if Gangtok is on your list then this sprawling loft is perfect for your gang. Sunrise over the mighty mountain, long chats in the terrace, music by the fireplace and bookshelves for a personal moment — this place is like a bespoke getaway that is made to fit your needs. If you’re the kind to explore and roam, then walk down to the busy MG Road to check out the local scene. A narrow alley near Darj’s Chowk Bazar leads up to a little cottage with a tiny attic whose wall-to-wall window overlooks the spread out town of Darj and the brooding mighty hills. Bare of fancy luxuries this one’s got a cosy floor mattress to snuggle up with bae or a book. Or you can just look out to the panoramic view and rehash your childhood yearnings of escaping into an solitary attic room. And if this pinch of a room bores you out for a while, then remedy it with a short walk to the Chowrasta Mall or to the Zoological park. Warm and cosy with low hung roof, the attic at Elim home has comfort for luxury. Don’t expect plush because this isn’t a five-star stay. But this squeeze of a room will definitely beat your stale hotel luxuries with its breathtaking views from the windows. Have tea by the window nook or spend a lazy day reading on the sofa, this kind of tranquil setup is not an easy find at all. A wood and bamboo cottage attic nestled in the hills and organic fields of a Gangtok village, this one is like a nature spa that’s never available in the city salons. A sensory treat of chirping birds, lush green hills and clear expansive skyline greets you from the attic rooms of the eco-friendly Mallingo Homestay. And because nature therapy is wholesomely good, you can try to trek or hike up the hills or even go on a village trail. This wooden cottage is a cradle of rustic charm: cosy wooden attic rooms tucked with a double bed, lovely little windows meant for the hills to play peekaboo and a bamboo terrace that oversees the entire town of Darj. Few minutes away from the bustling Chowrasta, the Attic & Bamboo Terrace B&B is your room with a view that will definitely make your vacay a golden one.